The other day a friend of mine made a comment that made my stomach turn. I LUUUUUUUV Pampers. I don’t care how much dioxin they have in ’em. Bold statement. Sarcasm? Maybe. Defense of a system she knows is bad? Most likely. Disposable diapers not labled as “unbleached” or “bleached with peroxide” contain Dioxin. Dioxin is a by-product of bleaching paper and according to the EPA is known to cause damage to the central nervous system, kidneys, and liver. Many consumers overlook what they can’t actually see (Dioxin), but ignoring the gel crystals is hard to do when they’re all over your child’s private parts. Sodium Polyacrylate is the super absorbent gel that allows your baby to go 5, 6, 8 or 10 hours in one diaper. No kidding. We’ve all seen those terrible pictures of poverty children wearing a diaper that sags to their knees. It’s not just the poor; it’s also the convenience driven “wealthy” society we live in. Sodium Polyacrylate has been linked in the past to toxic shock syndrome, allergic reactions and is very harmful and potentially lethal to pets. You may recall the headlines from May 2010, in regards to Pampers Dry Max diapers. I watched the San Antonio report from one mother claiming serious burns from Dry Max. It broke my heart. You could tell this mom just wanted what was best for her daughter. Many parents don’t even realize cloth diapers is an option today. 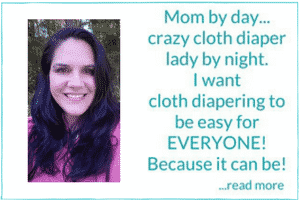 This mom, and many others, want a diaper that will keep their baby dry. Cloth diapers can give them this result without the harmful side effects. The loudest argument for cloth diapers is an environmental one. Those passionate about being green do a great job at letting their voice be heard. I suppose that depends on your definition of bad. Should we willingly and routinely expose our children to potentially harmful chemicals? Should we ignore that little voice that screams at us every time we throw away a wrapped up (in plastic of course) dirty disposable diaper? I think the answer is pretty obvious. Yes, disposable diapers really are that bad. This is great and helping me for my presentation about ” why we shouldn’t use disposable diapers. Thank you very much..
tnx; what a relief! This was my unanswered question for years. I love cloth diapers, they are more comfortable and safe for baby. I definitely agree that cloth is the way to go in terms of baby’s health and the environment. However, we do use a hybrid approach, meaning, disposables for trips and nights, and cloth for all other times. If you use a unbleached diaper such as Nature Babycare that has biodegradable ingredients, and no harmful chemicals, it’s really not as scary as conventional brands. Plus, its not that much more expensive! Borax is a natural water softener and laundry booster. I use it in my regular laundry and dishwasher with great results. Has anyone used it on diapers? I think you can use it on prefolds, but you’re not supposed to with most pockets. Not sure about fitteds or AIOs. We use BumGenius and I know you aren’t supposed to use borax on those. I do, however, use homemade laundry detergent made with borax and washing soda on just about everything else, including the baby’s clothes, cloth toys, burp cloths, and bibs. I’ve searched all over your site for an answer to this question with no luck, so I thought I’ post it here. I just (before deciding to go cloth) bought a HUGE bottle of Ecos laundry detergent from Costco. It has a fabric softener in it, which I know is a “no no” with cloth diapers. In your battling yeast post a while back you put coconut oil as a cream/salve to use with cloth diapers. The fabric softener in the Ecos detergent is coconut oil based. Do you think it would be okay to use with the diapers or should I get a different kind? No, I would not use it. It contains brighteners which leads to buildup plus the fabric softener which will lead to repelling. Costco does have an environmentally friendly option (kirklands) that works well. I’ve read that if you use baking soda in the wash to try and get your diapers white to use a bit of white vinegar instead of softener to neutralize the baking soda. The vinegar has to be used in the rinse not the wash so if you don’t have a place for it with your washer you can also use a downy ball. Without neutralizing the baking soda it it could give your child a rash. Again only what I’ve read as I don’t have kids…yet. I do know I plan to cd. Amy, as an aside, I’ve always heard that you shouldn’t use any sort of fabric softener (I don’t know anything about vinegar though) with CDs as it makes them repel (instead of absorb) liquid. I hang-dry our CDs, then toss the liners (we use AI2’s) in the dryer for 5 minutes to soften them up. We were actually doing great potty training. We were wearing underwear with maybe one accident a day. Then we got the flu and didn’t really want to go potty so mommy put us back in disposables because all the cloth was dirty from nightime use. We started getting spotty…mommy put us back in underwear and it flared up. We went back to disposables to use the triple paste without risk of repelling since nurses boast about it’s greatness. After a week we went to the dr and were told it was yeast. We stayed in disposables for a week to let the cream work without results. We went back to the dr and were told we needed a stronger yeast cream. We stayed is disposables two more weeks rash went away and immediately returned when we wore underwear during the day and a disposable at night while I figured out the best way to ensure the yeast was dead. We got another tube of yeast cream and two weeks later it looked no better….now I’m thinking maybe it’s not yeast perhaps he’s just allergic to the disposable diapers that he’s been unexposed to for so long. Could that look like a yeast rash? So yes I’m starting to think disposables are that bad and aren’t even good for part time use. I’m putting him back into the cloth and hopefully fleece is fine. Only one is suedecloth. Were you using Chlorine free diapers. My nephew could only use a specific type of diapers that were eco friendly and chlorine free because he kept developing yeast. I would try different brands. One with the least amount of chemicals because most likely they are allergic to the diapers. Wow, when I think chemical burns, I think of someone spilling something on themselves in a chemistry lab. But from a diaper? That is just frightening. Also, if sposies are trying to be more and more absorbent for ridiculous amounts of time (up to TEN hours in the same diaper? ugh. ), it seems like children are going have more troubles recognizing when they are wet, and therefore having more potty training issues when they get older. I have read that cloth diapered children potty train so much easier, and it makes complete sense! To me, the MOST important things when it comes to cd and for most things in general are; 1- people are becoming more AWARE of all the chemicals we are constantly being exposed to (I include myself here) 2-are spreading the word for healthier ALTERNATIVES 3- are making even the smallest CHANGES and 4- are at least TRYING! :) for a better tomorrow! We are not (at least I’m not and I’m sure most people here who share similar ideas) are not trying to enforce anything on enyone, we are simply trying and wanting; to make and HAVE heathier choices for ourselves and our families. and if we feel like telling who ever we want about healtier choices that are out there then why not? it is their choice to go with it or not. Not everything is going to work for everyone, and not everyone is going to agree on everything. In this case, don’t beat your self up if Cd didnt work out although you tried endlessly to continue with it! or.. if you had to or have to (like myself) either use disposible or do a combination of both disposible and cloth… its ok, this doest make us bad people . All in all, if our hearts are set to make this world better, heathier and safer for our families, then even the smallest step is a step forward! I do however find it kind of sad that in this conventional world, those of us who do want to make or want healthier choices, are very often critizized and sometimes even attaked for it. I’m personally a hybrid. I tried to be an “all or nothing” kind of girl when I clothed my oldest son. Then we went to Pullups when he started potty training, because frankly, I was pregnant with #2 and getting six hour blood transfusions twice a week while I was pregnant. So I was tired of trying to find a diaper that didn’t give my son a horrible rash at night and also wouldn’t leak, since I probably screwed up my diapers from all the washing routines I tried to get rid of the stench. So when baby #2 came along, I cloth diapered him full time, only to discover I had the same problems. So I compromise. He wears cloth all day long and uses an overnight Huggies during the night. He doesn’t leak and he doesn’t break out. I work full time as a teacher and trying to figure out the rash issues and stink issues was causing me to waste a lot of water and a lot of mental energy. (I tend to obsess.) So I decided that by being a hybrid gal, I could save myself time and energy. Yes, I have to buy disposables for my kids about once a month or two and yes, they are exposed to chemicals at night, but I also need mental sanity. And I’m okay with that. My second child also hated homemade baby food, wheras my first loved it. Guess what? I buy store brand baby food. So far, my kids seems just fine. I think as long as you make choices that are okay for you, then you shouldn’t be judged by others. Besides, being an extremist is annoying to others, no matter what your extreme may be. Good for you. It is all about what makes you and your baby happy. Not every baby and mother is the same, we each have different experiences. I hate when moms look down on you because of YOUR choices when it comes to your own child. Don’t ever let them make you feel bad because they are not in your life to see what you go thru on a daily basis. I know this is off topic for this blog entry, but I have a friend who is trying to CD. #2 due soon. Anyways, when she tried with #1, the poor thing ended up with awful diaper rashes, and has EXTREMELY sensitive skin. They also have VERRRRRY soft water, and were using prefolds/covers. PLEASE advise about wash routine with soft water, and if there are any tricks I’m missing to help her with…I’m hoping to narrow in on the right thing for them before #2 comes along! THANKS! PS: LOOOOOOOOVE your blog! Its just the support I need to LOVE CDing my 2y/o — I’ll actually be sad when shes out of dipes!! Soft water is great for laundry! Hard water is the problem. More than likely, the problem here is too much soap. Or, the wrong kind. The whole “Green” soap thing is fairly bunk. Soap, by it’s nature, is an aggressive compound. Whether it is conventional or enzyme based, it’s job is to break and refuse bonds of some basic elements. Nasty work no matter what you make it out of. The trick is to make sure it all gets rinsed out, which starts with not using too much in the first place. Soap actually does very little of the heavy lifting in the wash process, so you hardly need any at all.. The majority of the work is done by what is called “mechanical action”, this is the rubbing of the diapers against each other in the wash. Some of the eco soaps (A certain “Nut” for example) actually are made with things that hurt their ability to be rinsed out properly. This then requires “Breaking” or “Stripping” the diapers fairly often. If washed correctly, a diaper should never have to be stripped. But, any kind of residual in the diaper will lead to irritation. People often by dye and fragrance free “Hypoallergenic” Detergents, thinking that they have some sort of allergy to the soaps. The truth is that any soap is an irritant in a high enough concentration, tearing apart stuff is how it works. you just need to rinse it out. You can wash your clothes in arsenic, so long as there is none left when you put them on. Lastly, I would also recommend the B word. Yes, Bleach. If there is any sort of yeast infection, or ather bacterial problems, bleach “Sodium Hypoclorite” will kill it off. Yes, Yes, I know, Bleach is the boogy man. Not really. While Chlorine gas can (and Does) Create Dioxin in the propper environment/use (Like a paper mill), the same conditions do not exist in your home, or in a clothes washer. The Chlorine dissipates, becoming inert, and the substance turns into, essentially, salt water. Yes, It can cause other irritations if you sniff at the bottle, I will take a little cholrox over a yeast infection. You could also use a high strength (30%) Hydrogen Peroxide, but it is very unstable, and may or may not work. Wow. I hope your friend doesn’t read your blog. Yikes. This article reaffirms why I use cloth diapers. Personally I want the choices I make as a parent to have as little negative effect on the world my daughter will live in. By keeping diapers out of the landfill and reducing the amount of chemicals she is exposed to feels right to me. Cloth diapering is easier and less work than I thought it would be, yes its is a little more work than disposables but I think the effort is worth the results. Imagine how much crap would stay out of landfill world wide if more people used CD’s. I love cd and never had any rash issues it was great…until recently….we are battling a yeast rash. I switched back to disposables to help get rid of the rash. I tried washing in tea tree oil but that obviously didn’t kill the yeast. I didn’t even put him back in diapers I just put him back in the underwear he was wearing. He was doing a great job of potty training and loved his underwear before the rash occured. He wore his underwear one day and it started flaring back up. I really don’t want to bleach everything. Is my only other option to boil them? Any advise is great. So Perfectly stated! I tell everyone that I know that has or is going to have a baby that cloth is a great way to go. One extra perk, I never have to run out of the house at horrible hours because we suddenly run out of diapers! As a chemist and mother I just wanted to point out that not all “chemicals” are bad. Vinegar is a chemical too, as are the ingredients in laundry degergent and Bac-out. People label things as chemicals when they think they are harmful. Just a personal pet peeve, nothing against what you say here. That is what I love about cloth, I can change as often as I want and doesn’t cost any more or make any more work for me. I agree. I’ve had to use disposables for the past week because our washer died and laundromat or somebody else’s house is not an option. I really hate the plastic paper diapers and feel guilty every time that I put one on my son. I can hardly wait until we can get a new washer so I can go back to cloth. Autumn, this is a great post that says so well what I would often like to say. Now I can just refer people to your post. I was surprised that when my fellow public health friends (we were all in a degree program together) started having babies, most used disposables. Even folks who *should* know better maybe don’t know what the real deal is with disposables. This has been a fantastic article to read and the comments are the icing on the cake. I have used disposable paper diapers in the past but currently use cloth diapers . It was a choice that suits us well and I wouldn’t change for anyone! I think it is a very personal choice and to each their own just like breastfeeding, going organic/non organic, or any other situation we have to choose for our family. A comment made above was in need of some information when she said “both my husband and I grew up with them and turned out fine”. Back when we were younger disposables where bulky and made with cotton filling but they now use chemical in place of this to make it trim. Our children have not fulfilled their lives yet to determine whether these chemicals will cause serious damage. Is this the chance you are willing to take, playing the wait and see game? We all do it for many reasons but let your reason be your children’s best interest and not because someone did it and they survived unscathed. I hate when people say stuff like that. Although my husband would never not put our children in their car seats, he sometimes complains about the bulkiness of the ones I choose (I.e. Britax). When complaining he always says, well I didn’t even have a car seat and I’m fine (mostly to drive me crazy…lol). Anyway, we have learned a lot through the years and things change. It’s interesting that we make a huge deal out of disposables for our children, but not our elderly. My Grandmother is dealing with far worse conditions, as she is in a nursing home and is in a diaper far longer than my son. I have heard that there are adult cloth diaper options out there! I’m not sure where to look, but I was doing an internet search on flats one time and a site came up about adult cloth diapers. I know the nursing home aspect is tricky, but maybe you could bring it as a solution for the nursing home as a whole. I hope things improve! I have seen more and more options coming around. Like anything there has to be someone with a passion to fix the problem and the money and drive to make it happen. Hey, I’ve had a really hard time with starting cloth diapering. First of all, my hubby is against it completely, though he won’t fight if I get them, he won’t pay for them I’m having to save up part of my personal spending money to get them. And I won’t have enough by the time my baby is born in May unless I find some excellent deals. Also we live in an apartment and have to use a laundry mat. Which is located 2 flights of stairs above us. I really really want to cloth diaper, but if feels like I’m facing insurmountable odds and am thinking of giving up and waiting until we move sometime next year to an apartment with W/D hook ups. I just don’t know what to do. I really want to CD but I’m getting told on every side to either give up the idea completely or wait until we move and what with the money issue…(the money issue is my husband is a full time studant, his classes fully paid for by the company who laid him off, but he isn’t allowed to get a job until he graduates or we lose all benifits so it would be almost impossible to get the money any way but how I’m doing it now, even if my husband were on board)…I don’t think we will be able to cloth diaper for a while, unless I can find diapers and covers and stuff, everything I need to get started under 50. and from everything I’ve seen I don’t think I will. Even prefolds which is what I’m planning on getting. I guess this post was mostly a vent…sorry. But any advise would be well appreciated. Don’t give up it’s doable! My dh and I live on the second floor of our condo building with our 5 wk old dd – wash is on the first floor. I knew I wanted to cd her before I had her, and it’s working great! Dh was ok with it, but what really got him on board was our week stay in nicu with sposies. She had TONS of blow outs and messes. He actually came home with dirty jeans one time because he leaked. My mom comes over and helps bc dh works at least 50 hrs/wk and went back 3 days after she came home, and she’s enjoying cding(she wasn’t too keen on it). I digress… I have 18 prefolds that I’m using now – started with 24(6 were nb size that were grown out of quickly), and probably spent about $60 on covers and prefolds all new. See if there’s a local “green” baby store that sells gently used products, or look online to buy gently used product. Make wish lists and ask for cloth diapers and covers for shower gifts! I have two Eco friendly pals that gave me about $50 in covers and fitted. I also would buy little bits here and there, compare prices and I still watch like a hawk for sales. Every bit helps, and it is doable! Good luck! Hi C- this may be a long post but it is meant to be encouraging. I know what its like to have people doubt you and wonder “what are you thinking?” about cloth. But I do want to win your husband on board with your love and respect for him. This situation is not his ideal either and you are both a Team that will do whatever it takes for your family. And if you really only have $50 then go Tim Gunn and Make it Work! 1) freecycle/recycle. Craigslist and FFS on Diaperswappers is a great resource. Also http://www.clothdiaperfoundation.org. It never hurts to ask. I found a Mom that was moving out of state and did not want to take her diapers with her. She sold me 90+ prefolds and about 16 Bummis covers in various sizes for $60. It was posted at $100 but 60 was all I had and she was moving in 2 days. It’s a very simple stash but it works. When I had more money I went to a CD store and they let me try on different cover and diapers for my LO. She fit a couple better so I sold half of the prefolds and covers that I wasn’t keen on ($60) and had money for others. 2) flannel receiving blanket flats or flannel sheet flats with recycled bum sweaters Fern&fairie. Its would be less than $20 and usually the hospital gives you lanonlin and you can use it to lanolize covers. These are EASY to hand sew. I can do one in under an hour and Its not bad Very EASY directions. I also LOVE Autumns suggestion of Walmart’s camping section for wetbags I got 3 for $10. At home I use a reusable shopping bag. We found that air makes the diapers smell less. Did not believe it at first but when the air circulates the ammonia dissipates. 3)Let people know you want to cd. Ask them if they know anyone who cd’s. Then ask that mamma to see her stash then get some ideas and support. 4) If hubby will not be on board totally maybe ask could you compromise and use cloth while at home and disposables if you are out. Baby washcloths make wipes so keep on the watch. 5) I would strongly recommend cotton for shared washing situations. When you have your own washer you can wash and rinse as many times as needed but when you pay per use it can get expensive. If your baby turns out to need stay dry go to a local fabric store and get a scap of clearance fleece (maybe your hubbys favorite team LOL) and cut some rectangles to make a liner. Cheap and effective. 6)-10)….. you can do this you are smart enough to read this and many other blogs. Where there is a will there is a way. C’mon Mamma you are a creative force of Nature. You can do this. Just as there is no right way to raise your child theres a million ways to CD. Some like a simple stash (me) with aplix. (softbums , flip, & homemade wool covers with flannel flats and cheap fleece liners) Others like a variety and pockets and have heavy wetters that need microfiber and zorb and super wool. In the end it’s a poo catcher! And you and hubby will have a beautiful family. Good luck. If you want to chat you can email me at adholly1@yahoo.com. GOOD LUCK! Can you use money that would be going to disposables to buy cloth? You need to buy some type of diapers so money will be spent either way and cloth is cheaper in the long run. The Cloth Diaper Foundation is WONDERFUL! I am a recipient. They re-open apps TOMORROW. They are now taking the first 20 applications on the 1st and 15th of every month. Here is a great option. http://www.cottonbabies.com/product_info.php?cPath=138&products_id=2533 This kit was created for people on a budget. Follow the link here and read about the Econobum. The pack I’m linking to gives you 3 Diaper Covers, 12 Prefolds, and 1 WetBag. All of this for only $48.95 and FREE shipping. 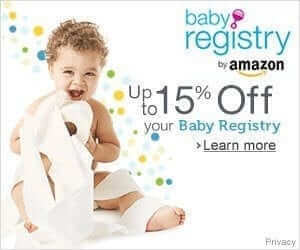 Also, if you don’t want to do prefolds here are a few other sites with great prices http://www.sunbabydiapers.com/cms.php?id_cms=6 or http://www.alvababy.com/. I haven’t tried the SunBabies, but I have heard they are pretty nice. I have a few of the AlvaBaby and really like them and I’m thinking of purchasing a few more. Good Luck! I love my cloth diapers! Thank you to all you ladies!!! My son is 11 weeks old and I have been cloth diapering him from birth!!! I worked out because I was given about 20 flannel baby blankets and I found some flannel at Joann’s for 75% off and was able to sew 14 newborn prefolds which I now use as inserts for the pockets I found (at Duck Duck Goose consignment sale for $6 a piece) I have 3 Kawaii (one is their cute brown cow minky, one is a teal with monkey’s and banana’s, and I have an army green), and 3 happy heiny’s (2 OS, and I traided the large for a Wahmies OS that I love)! I made 18 os no closure fitteds that I use with a snappi. I found an x-small thirsties, 3 size 1 thirsties duo, 1 Bummis super whisper wrap, and a newborn knit (by me) wool cover, and 2 small knit (by me) wool covers that I love. The cloth wipes I use are old baby wash cloths I got a ton of these at my baby shower when I was pregnant with my oldest. All paid for with $75…hubby was able to give me $25, when he realized I was going to cut up some of his old t-shirts I was so determined to make more diapers lol! He has now grown out of all the above mentioned diaper covers. I am currently knitting him some wool shorties, I when I traded for the Wahmies it got lost in the mail for a month because she forgot to write my apartment # on the package and the mom felt so guilty about it she sent me a Blueberry OS cover, and a home made medium fleece cover and 14 flannel wipes for free! I also bought a test diaper cover for a newly starting WAHM business for $7. I have a bunch of fleece that I’ve had for years and some that I bought for 50% off along with some PUL that I found 50% off and I’m making more covers for him. So it has been a busy few months keeping ahead of his diapering needs but I’ve made it work and it has worked great! I even use the recipe for Cloth diaper detergent, that will probably last most of my sons CDing years as it is a huge batch, I found at The Eco Friendly Family blog, it cost me not quite $30. It has been wonderful!!! As for the laundry, my legs get a great work out! At first my husband carried up the diapers and I followed to put them in the washer and start the wash…starting when my son was 2 days old…but my labor and deliver was really quick and easy so I felt like I had just worked all day on hard physical labor and was just a little muscle sore and tired but I could move and function just fine. So it wasn’t that hard! I’ve really enjoyed cding and overcoming the challenges of cding my son with so little money! Thank you for your support and your help and advice it really encouraged me to continue and strive through the difficult times! YAY! congratulations on your baby! Im so happy for you! On a side note, I drew up a liner pattern that works great and I’d love to share it with you(and anyone else who wants it) – I’ve been using antipill fleece and its amazing as a stay dry(but not so good at absorbing but it’s also good with poop). Also curly purly is a great knit wool cover! Hey! I’m from Romania, my name is Ioana. I read youre blog and i like it very much. It inspired me. Me and a friend of mine have a blog and a store with cloth diapers and eco stuffs. I’ve been cloth diapering my baby since the day she came home, she only used two disposables when at the hospital overnight day she was born. My wash routine is using charlie’s soap and it goes for one cycle wash and then another cycle without the soap for extra rinsing to make sure all the detergent is out. The problem lies with the weak seams of GroBaby disposable inserts. I tried them on a trip when Flip was out of stock. Flip is much sturdier because of it’s simpler design like a regular insert. When using GroBaby disposables, i’d change son more often. I’m confused, is the cotton and perhaps wool causing reactions as well as the chemicals? I’m trying to quantify if we are dealing with an allergy, toxic reaction from added chemicals, toxic shock from bacteria and or other waste or a person suffering from toxic chemical sensitivity syndrome? Maybe your baby has a food allergy? Mine gets rashes when I eat dairy. Great article/post! My favorite so far! I’ve forwarded it to all my friends and family with babies now and on the way. We have to take responsibility and do the right thing, and that’s not using “landfil diapers” as I call them. Ragababes have a FABulous size 0 2-step and newborn all-in-one. Try them out! what about when you’ve tried and tried and can’t find a cloth solution that will last through the night?? I can’t handle having to wash KING size sheets EVERY day not to mention waking in pee. We had to break down (much to my sadness) and use disposable with a pocket shell over for night time for my little guy. My toddler on the other hand has also been having to use sposies at night due to not being able to find a way to make her stop getting really bad rashes if wearing cloth overnight. You should look into using wool covers. Our son woke up wet every single morning until we started using wool, now he NEVER leaks. It is more breathable than synthetic covers too, so less likely to develop rashes. Try Kawaiis! I LOVE the Goodnight Heavy Wetters AND the Bamboo Minkies (mom label…haven’t tried blue). They work w/ NO leaks on both my 4-month-old AND 2 1/2-year-old! I double stuff the heavy wetter for the toddler, but just single stuff for my baby. I wouldn’t use the bamboo overnight until at least 10 washes b/c it takes that long to reach absorbency. Even with that, I triple stuff just to be safe. NO LEAKS! Try them–they are cheap! Check out http://www.jackbenatural.com. They carry them and have great customer service! I love reading your posts and people’s responses! For whatever reason, none of my friends (all of whom I love) does cloth diapering, and only one other mommy I know is still breastfeeding (our kids are 16 and 17 months old). My other friends assume I’m a nut, or a Stepford Wife, or a hopeless martyr for my kid, or a secret reincarnation of a 1950’s house wife. And I’m not any of those things! CD and BF just works for us, and I would never, ever preach to anyone else about it. Yet somehow it’s okay for people to openly and loudly condemn or question my choices. Sigh. It’s nice to know that so many other people have made the same choices as me — even if I’ll never meet you all in person! I have lost friends over these issues! Even though I used disposables on my first child, I breastfed her until she was 3 1/2. It’s too bad people are so quick to judge others, particularly when your choices are obviously made for the benefit of your children. I use both. 7th generation disposables (that I do not wrap in plastic for disposal) and cloth + wool covers. Full-time cloth left my son with terrible burns. We tried every detergent & wash routine I know of. Lol to the mom who insinuated that a bit of vinegar would take care of all ammonia issues!! It’s not that simple, but I’m glad youve found your solution! pure brilliance to catch some of those in a disposable. This is a great article. It’s so frustrating to have CD issues though. Especially when I believe all the reasons for CDing. I’ve tried everything, I mean, everything to get the ammonia funk out of my Rumparooz (except Funk Rock which was supposed to arrive weeks ago). Nothing has worked. I have some wonderful Ragababes that I’m using now, but if they start the ammonia problem, I will bail. This isn’t too big of a deal, since my son will be three next month and I’ll just force him to potty train (which is a semi-big deal because I don’t think he’s ready, but it’s better than the dioxin), but if my baby was young, I’d be reallyREALLY upset at being in this situation. Flip disposables are an option, but they are not cheap and we are on a tight budget. Someone needs to solve the ammonia issue for hard water people. Thank you for posting this refresher. Hopefully you won’t have a problem with your Ragababes as long as you use the recommended amount of laundry detergent. We love our Ragababes and have had zero issue with stink with them! Have you done an overnight soak with Rockin Green? I’ve also heard great things about this new detergent Eco Sprout and bought some to try because of the rave reviews and soaking our diapers in it got rid of any remaining stink issues we had. The only diapers we had that had stink issues were our BG elementals and an occasional fitted nighttime diaper. If you do decide to try Eco Sprout, definitely follow the instructions and do an overnight soak in hot water. Hope that helps you! Heather- I have done two Rockin Green soaks. You name it and I’ve tried it (except for Funk Rock… I’m so sick of spending money on things that don’t work). We’ve had some problems with ammonia, but nothing too horrible, and my son has never had ammonia burns or a rash. Mainly the smell bothers me. I’ve tried several methods to deal with ammonia in our cloth diapers. I read something about boiling diapers to rid them of ammonia buildup, so I tried it and found that it helped a lot! Not completely got rid of it but close, though I find I have to do it periodically to maintain, about once every couple of months, and it is quite a pain to boil them all even with two very large pots. I do wish someone could come up with a concrete solution to the ammonia problem. If it weren’t for the ammonia smell from nighttime diapers I would have zero complaints about CDing. His bottom gets the red burn. He cries when he urinates and the diaper reacts. I did the boiling, but the problem was back within a week. How do I know if my child has an ammonia burn? My dipes don’t smell like ammonia (once they are washed, but I’ve smelled it a couple times if I left them out of the diaper pail for too long while dirty.) I’m starting to wonder if this is her current “rash.” It keeps going away and coming back. I wonder if she is getting it when she wears certain dipes? What should I do?! Autumn? I’m in the same boat too. Currently using sposies at night although I obviously would rather not, but every time I try again, she wakes up screaming in the early morning (and I mean early) with ammonia burns. I’ve tried RnG soaks, which helps ( no longer gets them during the day) but still no better at night. I tried stripping, multiple rinses… I haven’t tried boiling yet- can anybody tell me what is all safe to boil? Can I boil my pockets, or would that be bad for the PUL? Can I only boil inserts and prefolds? boiling PUL isn’t recommended. i would only boil inserts and prefolds. This may sound gross but what about a turkey fryer to get rid of the ammonia? My great-grandmother had huge cast iron wash pots (read that “cauldrons” that they boiled wash water in. But those aren’t practical for today. The next largest thing I could think of that gets a lot of liquid hot is a turkey fryer. It gets a lot hotter than boiling and they are pretty big too. I’m seeing some that are 32 quarts (8 gallons). That’s almost twice as big as my largest stock pot. They are around $100 depending on features and size. Some have baskets like smaller deep fryers so you could lower your load and get it out again easily. It’s a better working height too since it’s designed to have huge turkeys lifted in and out. A long dowel or a pole like goes on a paint roller would be good for stirring. Of course that would have to happen outside – or maybe in a garage as long as there is good ventilation. Boiling huge pots in your house all the time might lead to mold issues unless you have some serious ventilation, like a commercial range hood that’s designed for that. Mold is tricky, you may or may not be aware it’s even becoming a problem until its pretty far along. And its a lot of really hot water, it would be easier to fence off an area around it outside with little kids. Be careful with the water. Boiling water will kill plants. It’s handy for the weeds in the seams in your front walk but you wouldn’t want to just dump it off the back of the patio while it’s still hot (common sense I know, but better to point it out than have a bunch of greenery die). Oh, and make sure that it’s purpose labeled so no one goes cooking a turkey in it. If the in-laws already don’t like CD, that would make for a truly awful thanksgiving. One of the other comments mentioned trying to get rid of yeast. Try microwaving the diapers – as long as there are no metal snaps. It works for women with yeast infections – microwaving the underwear to break the cycle. Wish I could Facebook “like” this to pass on to others! I’ve been CDing full time for about 4 months…we used 7th Gen disposables for the first couple weeks because she couldn’t fit into cloth yet. I am so upset with myself that I didn’t jump into cloth with my first. Then again I was 21 and pregnant and kind of stupid. I will never go back to disposables ever again (save the rarest of emergencies, and still I will go back to using 7th Gen). I recommend to all my friends (who have kids or don’t) to start with cloth diapers and even a couple of them have said that when they do get ready to have kids, they’ll do cloth diapers. I surround myself with cloth diaper mamas (And even I was a cloth diaper baby. So was my brother) and its just the best choice for our family. My husband, who wasn’t really excited about it, loves cloth diapering and I know I’ll never have to try to convince him ever again. This is a great post, and I’m sure, had I read something like this when I had my first daughter, I would have switched. My mom even suggested it, but all I thought of were the pre-folds with covers and I didn’t want to deal with that so I shrugged it off. Funny, I was a cloth diaper baby (as well as some but not all of my siblings) and my mom told me not to bother, it was not worth it- because all she knew were prefolds and plastic covers. Thankfully I discovered how different it is now! We’ve tried it all … used Seventh Gen, cloth, and Pampers … our lifestyle has changed dramatically over the past year, and I’m glad we had options. One group I wish I heard from more often is CD moms who work full-time outside the home–I’ve just found it nearly impossible to maintain CD since returning to work. I went back to work full-time after only 5 weeks of maternity leave (for money reasons). My husband works nights and weekends while I work days, so we trade off keeping our little boy (now 11 weeks) at home. I sometimes take him to work with me to give my husband a break so he can sleep. When we go out or have someone watch him, we use our stash of Flips with disposable liners to make it easier on them. I’m very thankful that we’ve been able to save on daycare and spend more time with him, especially because I know that’s just not an option for many new moms. I work full time and my husband works 70 hours a week. Most of my hours come from the weekend, as I work 14 hour shifts. There are many weekends where I work Thur-Sun and come home at 10pm, stay up to wash diapers, put them in the dryer and stuff them in the morning before going back to work at 8am. It IS a lot of work, but I love doing diaper laundry! Also, if I am working, I try to stay a day ahead of diaper laundry, so I can wash them one day and stuff them the next! The days that I send my son with a baby sitter, I DO send him in Nature Babycare disposables. They are made without a lot of the harsh chemicals and I really like them! But, I only send him in sposies because I don’t trust my sitter with my cloth. I feel like she doesn’t take care of them and don’t want to risk her ruining them! Also, using All In Two cloth diapers really cuts down on laundry and allows you to buy a lot more for your money! Prefolds are great for keeping costs down, so you *could* buy a bunch of them and just wash less often… I have never felt like I don’t have enough time to cloth diaper my son even though I work 40 hours a week! Both my husband and I work full-time and we also CD full time. We use all in ones. I like the concept of all in twos but they don’t seem to work for my son and I don’t think they are as daycare friendly as all in ones. Whenever we have used an all in two we haven’t been able to reuse the cover because it is either wet or he ends up getting BM on the leg gussetts. We have a large enough stash that I wash 3 to 4 times per week – usually Monday, Wednesday, Friday, and then possibly Sunday or I just wait until Monday. I do the diaper laundry in the early evening and get my pre-wash done and then start the main wash (which I add a 2 hour soak to so it takes 3 hours), when I wake up I do one more hot wash without detergent (go for my morning run or go to the gym) then I put them in the dryer when I get home from my workout. I usually dry them for 2 hours on medium heat, although they would probably be done sooner or I could put them on medium/high heat. When I come home I pull them out of the dryer. Because of the size of our stash we have enough of a rotation that I can take them out of the dryer that evening and get them ready for us or to go to daycare. Usually I take in 12 diapers in the beginning of the week and then replenish at the end of the week with what is needed depending on how many diaper changes he has had. Honestly diaper laundry is easier than doing our regular family laundry! Just put it in and let the washer do its job! I am a CD mom who works full-time outside of the home. Currently, we use pocket diapers. These seem to be the most convenient CD in my mind. I talked to our daycare provider about trying the CD, and she was very willing to give it a try. I think the fact that the pocket diaper works a lot like a disposable (one piece) made it manageable. I just pack the diaper bag every morning with enough CD and a wet bag for the day. I have enough diapers for a 2 day supply, and wash the diapers every-other night after my DD goes to bed. I line-dry the shells, and stick the inserts in the dryer before going to bed myself. In the morning, before leaving for work, I stuff the diapers, and pack them in the diaper bag. This routine has been simple and easy to manage while working full-time. I will say I am very appreciative of my daycare provider being on board with CD. I work 30 hrs a week- and I agree, it is hard to keep cd! My baby sitter is willing to use cloth but I have ended up only sending pockets as she won’t reuse the covers at all. I have to admit, some days I haven’t been able to finish the laundry and I have to send sposies. If my babysitter would only learn how to use prefolds it would be so much easier to keep up! I’ve been CDing for 3 months now, and I would have to say the environmental benefits have probably been the biggest pull for me. My daughter was fine in disposables, and my husband and I both were raised in disposables. Even though there may be harmful chemicals in disposables, I didn’t quite see the risk, or worry about it. I still have friends who are using disposables, and am happy to share my love for cloth diapers, but will respect their decision to continue using disposables. I do know, for me, I love CD! I do feel better about not dumping bags and bags of diapers in the landfill each week. That’s my main reason for CDing. Ammonia build up is because of not washing appropriately. My cloth diapers are made from recycled fabric, from old sheets appropriately and other cotton cloth from clothing. I use an new HE machine for the last 3 month and still not rashes have been cloth diapering with the same prefolds since he was 6 months old and he is now 11 months old. He is starting to show bladder control because he holds it for about 3 hours goes and then tells us to change him. I add a cup of vinegar in the second to last rinse every-time I wash my diapers. It is simple chemistry vinegar is an acid ammonia is a base this would be called a neutralization reaction. If I notice any ammonia odor other oder I rewash and rise with vinegar. But I have found 2 washes and 2 rinses work with my HE machine. I respectfully say that this is not always the case. I wash often (every other day). I rinse. I use the correct amount of detergent. Vinegar is actually a bad thing to use in really hard water (which is what I am dealing with). I’ve even tried it (before I knew it was bad to do). We did not CD our 1st. And, I regret it. At age 3, she still has red bumps on her little bum, even though she is potty trained, and only wears ‘pull-ups’ at night. I’m so glad that we’ve chosen to CD our 2nd baby. I’m still urging my husband to get on board, but I’ve gone ahead and made the decision for us, and your post just confirms my reasons. My husband was against cloth diapering our second child. He was adverse to washing dirty diapers in the washing machine–he was concerned that it wasn’t sanitary and there would be residue from the diapers that contaminated our clothing. I did much more research than I might have otherwise to try to get him on board, and the only thing that changed his mind was saving money. Even so, he is still not 100% and we have been using them for 1 1/2 years now, but it’s a compromise he’s made with me because he knows it’s something I really want to do. I totally agree with you Cortni. Cortni, with respect, the “I turned out okay” statement is really bad logic. Imagine someone saying “I did drugs when I was younger but I turned out okay later, so it’s fine to do drugs.” With toxins and chemicals, you do not always know or see the effects immediately. It may take years or a lifetime before effects are seen. There is no judgement because MOST people do use disposable diapers. But I think you should think more about:”…without harmful effects to their babies.” Really? How can you know that? That is the argument I hear so often about so many different un-natural things ranging from chemical-laden dog treats to immunizations to disposable diapers. My friend and my FIL have both recently defended using certain products by saying “if they were unhealthy for us someone would tell us not to use them OR people would be getting sick so we’d know not to use them.” Well….. LOTS of unhealthy things are sold (like cigarettes!) so just because they are avail doesn’t mean they are okay AND lots of people ARE getting sick (allergies, diabetes, nervous system ailments like MS and Parkinson’s disease, etc, etc). Cortni, you are absolutely right. Do what you feel is best and don’t let these other mothers make you feel bad with their illogical reasoning. Yes, cigarettes are sold, but we all know they are bad because research has been done to prove that. Now will you anti-immunization mothers accept the research that proves your theories wrong? Immunizations are not just a personal choice for your child, they affect all of the children and pregnant women around you. 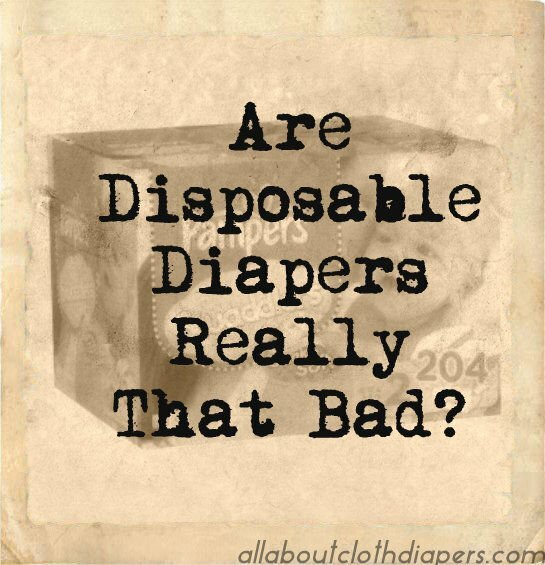 And there is absolutely no link between disposable diapers and things like diabetes, MS, and allergies, those diseases have known causes, which have nothing to do with diapering. If you are happy with your choice to cloth diaper, then be happy about it, don’t try to convert other people because you will only force them further away from your cause. Great article and part of the reason we starting carrying beautiful cloth diapers in our child safety store. I have tried both. I like cloth in that I can save money and not have the “poison” crystals on my babies, however, My son gets a bad rash every time i have used cloth. (Several different brands) I have several family friends that use cloth that have gotten ammonia burns, and it is no fun. I have switched back to disposable. I see the harm in the chemicals, but we live in a chemically filled world. We drive cars that put out bad chemical, eat food with chemicals, live in houses with chemicals in the paint, and have we not seen the signs in the store aisle that say there are harmful chemicals in the products, and ect. ect. ect…..
We as parents have a right to use what diapers we choose, and should not look down our noses at some one for using cloth or disposable. Does everyone that uses cloth eat an organic diet, use chemical free cleaning supplies, ect? I think not! No condemnation. Just laying out the facts. We do live in a chemically filled world which is all the more reason to make as many healthy choices as we can. I mean no offense, but to me when reading this, what I hear you saying is “we’re already drowning in chemical exposure, what harm could come from adding one more to the list?”. It sounds like you have given up because of the ammonia problems, and I’m sorry to hear you’ve had problems, but I will also say that cloth diapering does require more work (including research in ways to combat ammonia build-up) and that is part of the trade-off. I agree with Autumn, the chemicals in our world are just more reason to make as many healthy choices as we can. There is no way with the world as it is now to get away from all chemicals, but we can at least try as caring parents to prevent some of the exposure to chemicals. And as you said, not everyone who uses cloth eats an organic diet or uses chemical free cleaning supplies, but our family does and I know many others who do as well and it is a conscious, and sometimes inconvenient and difficult, choice we make for the health of ourselves and our family. I have done research and made a serious effort to find what is best for us, and sometimes that includes compromises. I don’t look down on those who use disposables, in fact I used them for my first child…HOWEVER I think a large number of those who do are not aware of the risks and side effects or the other options they have, as was I. Everyone has to make their own choices and do what they think is best. First, I wonder if your baby was allergic to microfiber? I had to switch to all natural fibers – cotton, hemp and bamboo- inserts and she stopped breaking out. Second, no I don’t eat all organic food, but I do use as little chemical containing cleaning supplies as possible. Vinegar and water are amazing! I also don’t vaccinate because of chemicals (formaldehyde, anyone? ), but that is my choice for my kid. I certainly would hope these choices wouldn’t be looked down upon either, but hey, they are. Nobody looks down their noses at those that use disposables. I myself try to educate people that there are alternatives to disposables. If people choose to still use disposables, I could really care less. It doesn’t affect me. Really. I’ll do my diaper laundry and you take out your diaper garbage and we can all get along. Actually, using cloth diapers is one of the main things that helped us change much of our lifestyle to a more eco-friendly one! It’s a gateway green item!! We always recycled. Now we compost too. And use chemical free cleaning supplies (vinegar and water, baking soda, etc), eco-friendly laundry and dish detergent, dryer balls instead of sheets, cloth mama pads, cloth wipes, cloth napkins. Heck – I don’t even use disposable sponges anymore. And yes, we eat organic and whole foods as much as we can – it’s a bit to get used to, but it is SO much healthier for our bodies AND our planet – because any food that doesn’t need to be manufactured in a factory is going to have a lower impact on our world right from the start. We battled ammonia at one point too. And I just got rid of the microfiber and now we use all natural fibers for our absorbency in our diapers – and started rinsing night diaper inserts out in the sink after taking it off in the morning. And we haven’t had issues (or a SINGLE rash) since. Prefold diapers make great inserts. And hemp inserts are trim, absorbent, AND natural. And, yes, I’ve used disposables on both of my girls at one time or another – (thankfully neither seems to have any reaction to the chemicals in them) – and honestly – they are more of a hassle to buy and dispose of than dealing with washing my cloth. And they don’t work nearly as well. Sure, it may absorb a ton, but does it hold in poop? Sometimes. My cloth holds the poop in every time. So – for me, they work BETTER than disposables. And when I’m done using them? I can sell or trade or give them away to keep getting used over again. You could try eating non pasteurized dairy. I can’t do pasteurized and my month old daughter doesn’t appreciate it when I do either… ;-) but I can drink/eat as much non pasteurized goat and cow milk as I like. So if you’re really craving dairy you might want to try that. To know that I am not contributing to the garbage and the landfills is an awesome feeling. I find it funny how when people “find out” i do cloth they start defending their choice to use disposables. It is your choice, I just am not going to put my babies health at risk for a supposed “convenience”. I have 2 in cloth right now and if my 2 yr old son doesn’t decided to try the potty soon in august i will have 3 in cloth! So really it isn’t THAT hard! People need to just give it a try, that is all i ask (and a fair try) Some of the reasons i get told for people using disposables are ridiculous, to me are not worth the health risks. Everything we do in life is a choice and cloth is just another “good” choice we can make. But then I love cloth! yeah I saw someone saying online in response to are CD’s that much cheaper– that ‘the CD people make disposables sound more expensive than they really are’… and ‘I only change my 2 year old 4x per day’ ‘who changes their 2 year old 8-10x/day’ .. I seriously almost threw up. Who leaves their 2 year old in their ‘cr@p’ for that long? Don’t you WANT them to feel dry so they potty train? I did not say a word, but figured this was a good place for this comment. That might have been me – I was involved in a FB conversation along those lines. I CD part-time but not during hours where my son is cared for by my mom – she doesn’t charge me so I respect her wish not to deal with CDs, despite me trying to convince her of the huge changes in CDs since I myself was a baby. Someone pointed out a RIDICULOUS amount that they were spending per month on disposables. I replied that they can be purchased for much less (and I stick with the “natural” varieties) by watching sales and clipping coupons. 2. From what I know, you don't WANT your kids' diapers to feel dry when you are trying to potty-train, you want them to know when they have wet and be uncomfortable in it. That is one of the reasons that kids who are CD'd are supposed to be much easier to potty-train. All that said, I love CDs and CD mamas! I agree totally with you. My 12 mon old can stay in a disposable for 4 hours. But, in a single-stuffed Bum Genius, he would be leaking out of it at 2 hours max. I know this doesn’t help the CD side, but I recently paid 9 cents each for Luvs size 4 on Amazon. I think leaks must depend on the kid. DD#2 (4 months) can wear a single stuffed BG 4.0 12 hrs/night w/ NO leaks. DD#1 (2 1/2) can wear one overnight double stuffed w/ no leaks. We use mainly Kawaiis w/ no leaks. I love the stay-dry feature of pockets. I still try to change every 2-3 hours, but they’ve been in them much longer when we’ve been out and about, and they still end up dry and leak-free. I think it depends on your child and your cloth diaper of choice. I have a heavy wetter 13 month old and we can get at least 3 hours between diaper changes, as long as there isn’t a BM, with our Ragababe AIOs. My son is pretty much on a schedule so I know that he will have a BM shortly after waking, usually one shortly after lunch before his nap, and then sometimes one in the late afternoon/early evening. I agree that 4 diaper changes per day is absolutely ridiculous; that child should be changed more frequently for sure. In the beginning with only CD part-time, and maybe it had to do with my son’s age or the chemicals in the sposies (we used swaddlers), but as soon as he would pee he would scream and want to be changed. We were going through a ridiculous amount of diapers. He has done so much better with the cloth – less frequent changes as well as less frequent rashes. No matter what you have to do what you feel is best for your child. Funk rock is expensive but it does the trick when the directions are followed. I know what you mean about being frustrated with funk! I am throwing out the microfiber and going with prefolds. I added a few to my rotation a few weeks ago and they have been awesome. If you soak in BacOut, be sure to do the soak in cold water, as the hot will kill the enzymes that make it work. When your soak is over, then do the HOT rinse to make sure to get all of the enzymes out of your diaper. Those enzymes are good for cleaning dipes, but can cause a rash on baby skin. So rinse good and rinse HOT! Oh – and Funk Rock, if used properly, has shown great results as well! You need to Rock a Soak with RnG first to get buildup out. Then do a Funk Rock Treatment. Then rinse rinse rinse rinse rinse!! I collect the Pampers rewards codes when I find them online and they had an eco quiz thing to earn some points so I did it. It was pretty funny reading all of their articles about how eco friendly they are. The most interesting article (and slightly amusing) was the one that talked about how good it was that their diapers aren’t biodegradable. Basically they claim that biodegradable trash produces a more negative environmental impact when it’s put in a landfill then non-biodegradable trash. They could be telling the truth on that one which is a really good reason for composting all of that food garbage and recycling our paper products instead of sending it all to the landfill. Yes, I could recycle so much more than I do. It’s posts like this that get me tweeting and facebooking to all my friends and family that they NEED to use cloth diapers. Almost all of them just roll their eyes at me though and it’s just so INFURIATING! How can they willingly expose their children to POISON?! The people I have convinced have done it for money reasons, but hey~ whatever gets them to use cloth, I’ll take it! Thanks for the great post! I’m off to spread the word to read it!